How does the visiting team confirm a game? 2. Click on the Sign In button on the upper right side of the home page and then log in with your email address and your personal password for your account. 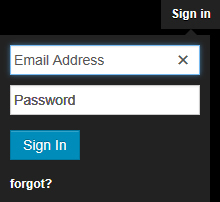 If you forgot your password just enter your email address and click on the Log In button. An email will be sent to you with instructions on how to set your password. NOTE: You need to be assigned as a Scheduler for each team that you are adding games for in the system to have the rights to enter games and confirm games. The NCJLA Webmaster should have made this assignment if you were listed as the Scheduler for teams. 4. 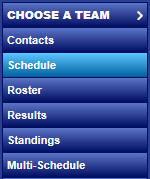 From the Teams tab page, select the appropriate Season, then League (Division & Conference) and finally the Team. 5. Click on the Schedule button along the left hand navigation. 6. To confirm the game click on the orange edit icon. 7. This will bring up the following screen where you can select Confirmed under the Status dropdown list. Click on Submit to confirm the game. 8. The game will now have the green check mark icon next to it. IMPORTANT: After scheduling has closed, any changes to the games and or cancellations will need to submitted via the NCJLA website by rolling over the Club Administrators tab and choosing the Submit Game Schedule Change form.